Another card for a valuable volunteer! I don’t know what our school would do without these dedicated individuals! 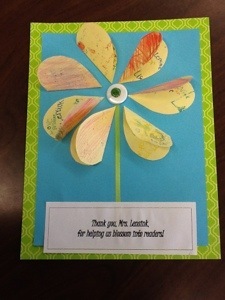 Posted in Classroom, Kids, Uncategorized and tagged appreciation, Card, volunteers. Bookmark the permalink. There is a time for everything under the sun. King Solomon said that. Summer is time to recharge and rejuvenate. Although I know they need a break, I long for my students to review. I fear the backslide after they have worked so hard to get to where they are. 1. Do it regularly so that it becomes “no big deal”, just part of the daily routine. 2. Review should be at a level that it can be done independently. You, the parent, are the enforcer, making sure it happens, but kids should be able to do it without you. In my house a math page and a French activity must be done before screen time. Since my kids want screen time, they make sure to get their work done. 3. Give your kids the option of just going to bed OR going to bed and reading for twenty minutes. Kids will say, “Can I just go to bed later?” You say, “No, you can go to bed now with reading or without, but you go to bed now”. My reluctant reader always chose reading in this scenario! Soon he was into a book and was seen picking it up during the day too! I am looking forward to renewing my focus and reflecting on my year. I hope my students take time to remember their achievements and solidify their learning. Posted in Home, Kids, Math, Reading and tagged review, Summer, time. Bookmark the permalink. 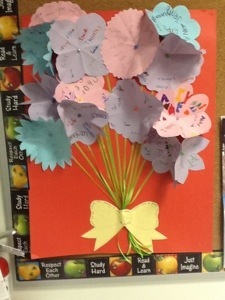 Each student wrote on a heart, forming a petal. Beautiful messages for a much loved helper. Posted in Classroom, Uncategorized and tagged appreciation, Volunteer. Bookmark the permalink. Emotions and Learning – Be a Cheerleader! EMOTIONS CAN MAKE US SMARTER. We sometimes give short shrift to emotions when we’re talking about academic success, but the science of learning is demonstrating that our emotional state represents a crucial internal situation that influences how intelligently we think and act. When we’re in a positive mood, for example, we tend to think more expansively and creatively. When we feel anxious—for instance, when we’re about to take a dreaded math test—that anxiety uses up some of the working memory capacity we need to solve problems, leaving us, literally, with less intelligence to apply to the exam. One line of investigation within the science of learning has to do with the feeling of hope. Research in this area has found that a feeling of hopefulness actually leads us to try harder and persist longer—but only if it is paired with practical plans for achieving our goals, and—this is the interesting part—specific, concrete actions we’ll take when and if (usually when) our original plans don’t work out as expected. Posted in Kids, Uncategorized and tagged emotions, hope, learning, moods. Bookmark the permalink. My son had a difficult start with reading. 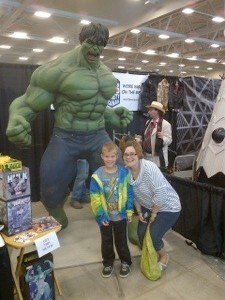 He got extra help at school (we love you Mrs. L.). When he “graduated” from the remedial group he was kind of sad because it had been so much fun and so rewarding. 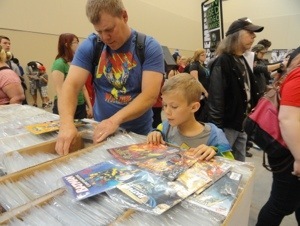 That’s when we bought our son his first superhero encyclopedia. He read it, and read it, and read it, and ….. He now has more encyclopedias and they are held together by duct tape. He is reading words like “pyrokinetic” and “intergalactic”. Repeated reading builds fluency. This summer, it is important for parents to know that when it comes to helping your child read more quickly and more smoothly it is the quantity of reading that counts more than the quality. I hear some parents that want to “push” their children to read more challenging books but if fluency is your target, aim for books that are at your child’s independent reading level and encourage them to read it again and again. Posted in Reading and tagged fluency, summer reading. Bookmark the permalink.